Boil six eggs for 10-12 minutes. Place the cooked eggs in a bowl of ice water to cool, and set aside for 15-20 minutes. Remove eggs from ice bath, peel, and slice into length-wise halves. Grab your mortar and pestle and grind the mustard seeds and black pepper into a fine powder. Gently remove the egg yolks with a spoon and place into a bowl. Set the remaining egg whites aside. 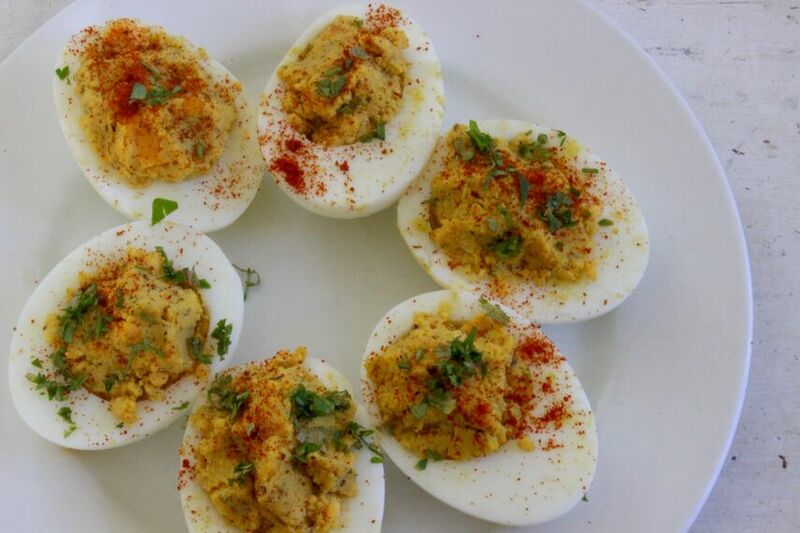 Combine and mix egg yokes with kombucha, mustard and black pepper powder, cayenne pepper powder, salt, and turmeric powder. Place the egg whites onto the serving dish, or the storage container, and then return the seasoned egg yolk mix to the egg white halves. Sprinkle with paprika. Grab your fresh parsley and pull as many sprigs as you wish. If you want to have chopped parsley as garnish than now is the time to chop. Sprinkle or arrange the parsley on the devil eggs. Devil eggs are a sure fire way to satisfy your friends and family, and provide a principle side dish for any afternoon picnic or evening dinner party. If you don't have access to kombucha I would suggest unpasteurised apple cider vinegar–with all the healthy sediment. For info on how to make Kombucha, see Zenith's DIY kombucha recipe. Try to grind your own mustard and black pepper seeds, the vitality of the dish all the better. Enjoy!